This is the perfect fresh dessert to enjoy this time of year when strawberries are sweet, flavorful, and abundant. It’s great for entertaining or to bring to a gathering because the shell and cream cheese filling can be made in advance. On the day of your event, simply slice, arrange, and glaze the strawberries, and serve. The best part is that the shell and filling are super versatile; top with blueberries or raspberries in July, peaches in August, or whatever fruit is fresh and in season. In a food processor, combine the brown sugar, flour, and butter. Pulse until the mixture forms coarse crumbs. With the machine running, add the vanilla extract. Pour the mixture into a 12-inch tart pan with a removable bottom. Using your fingers, press the crumbly dough evenly onto the bottom and sides of the pan. Bake for 12 minutes. Cool completely. Using an electric mixer, beat the cream cheese, confectioners’ sugar, heavy cream, and lemon zest until light and fluffy, about 5 minutes. Spread the filling evenly over the cooled crust. 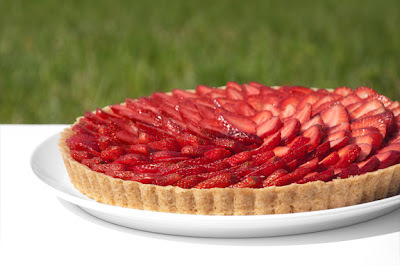 Arrange the strawberries on the tart in an overlapping circular pattern working from the outer edge in. Heat the strawberry jam in the microwave for 30-60 seconds, until melted. Using a pastry brush glaze the strawberries with the jam. Enjoy! That looks SO delicious! Did you make that for Father's Day? If so, you've got a very lucky dad!